BIG question for you Business Owner is: how to orchestrate “Extended Leave” from my very own business? That is, to carve out the time for you to enjoy perceived FREEDOM of business ownership and to look forward to going back to well established, thriving business when the time is right. “Why would I want to do that?”, I hear you cry! Granted, there seems to be this unwritten, unspoken rule that goes along the lines of, if you are a business owner then how dare you think about taking time off for any reason, let alone for an extended holiday. Some would argue that wasn’t it because of this FREEDOM that many a business starts in the first place? Seriously, whatever plans you put in place at the time of extended leave will generally work out in the end, for the most part. Were they ideal is the question explored after the fact, but then it’s too late. Instead, why not consider consciously locking out time to spend holidaying, knowing you do not have to worry about the day to day mechanics of the business for a set period of time? Here’s what I know for sure, leaving what you want to happen to chance is quite often the worst way to think about how you want the months away to play out. Hasty decisions made tardily in a stressful period may not be in yours and your business best interest. If real difficulties arise, sometimes the issues can trigger a throw-in-the-towel moment, resulting in walking away and just “shutting up shop”. Appreciating that if this is extended leave #1, then you don’t know what you don’t know…yet. And even if it is break #2 or #3, one cannot be relied upon to be the same as the last, so newly formed considerations should apply each and every time. 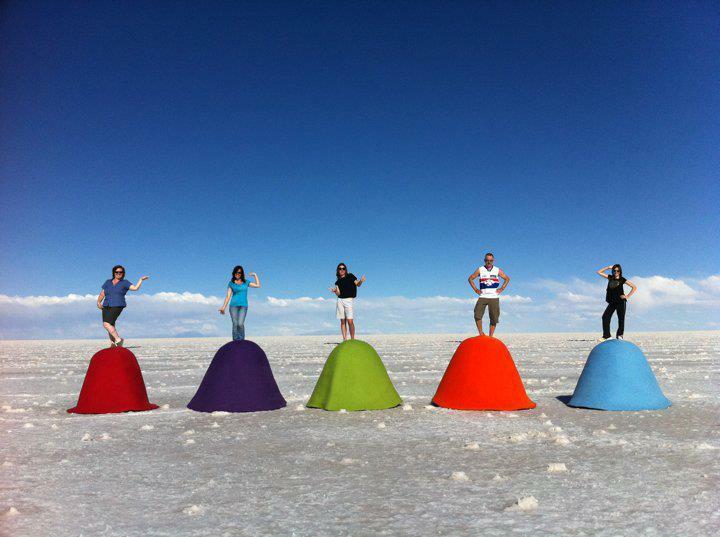 From one who has been there, done that e.g: travelling on BIG adventures every two years after having taken over a business, building it to 7-figures and selling it after a 15 year reign whilst as a single mother…facilitating a structured way to have a chunk of time off and being paid regularly is critical. 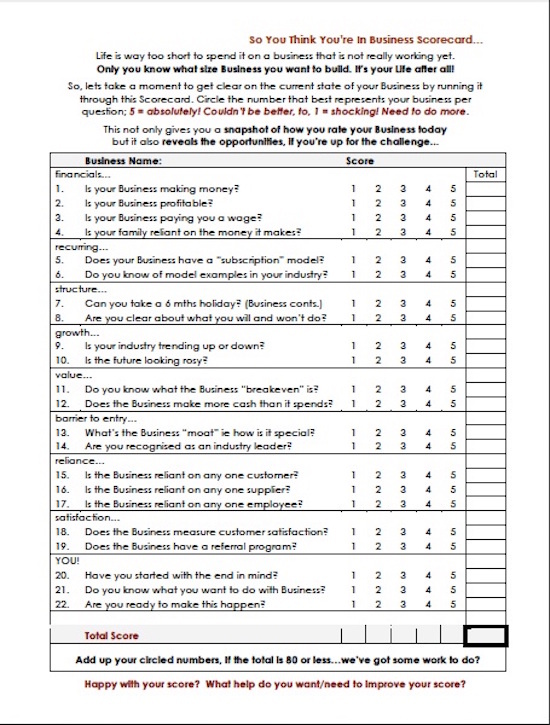 So, firstly (given we are in planning stage), let’s take a moment to get clear on the current state of your Business by running it through (what I affectionately call) the “So You Think You’re In Business” Scorecard. The final score not only gives you a snapshot of how you rate your business today but going through the process also reveals the opportunities and the reworks needed to finish your unfinished business in readiness for this next BIG holiday in your Life… if you’re up for the challenge that is? • What needs to get done? • What necessary adjustments need to be made? When starting out in business, it is often touted that you should “start with the end in mind”. I for one talk about it all the time! However, whilst I completely understand that by bringing a BIG holiday into the mix it is not THE end of your business. Assuming you want to come back and step right in where you left off, you need to set it up that way. Giving this a good hard think and deciding what to do may be influenced by the much-debated notion of why can’t I “have it all”? As we know, just because you can (potentially) doesn’t mean it’s the best thing to do, for you, at this particular time in your life. What you choose to do with your business has to work for all concerned. Business and therefore investigate the ways and means to set up life whereby you can have as much of the “all” as makes sense for you. Let’s face it, the most precious commodity a human has is that of TIME. It cannot be banked, withdrawn and used at a later date. It is not refundable, no matter how hard you wish it to be. And you also know how long it has taken you to grow your business to where it is today. Taking all this into account, by being guided through with your pre-holiday that on enables you to comes to terms with how to combine Basking and Business. If worse comes to worse and you just can’t see how it can all piece together, we can always talk about taking the Business to market and selling it… but let’s not be rush into anything just yet. Wishing you all the best in whatever you decide to do.